butterfly teaches that we are to grow greater and make life more beautiful because of our passing. This is a Universal Spiritual Teaching, although, this Great Spirit is held in high esteeme by the French, South Americans, and Japanese. The Butterfly taught each of the People from these Cultures and teach all of us today, the exact same things, for it is the Creator that gave them purpose and their purpose has not changed, from the Beginning of Time. This is a spiritual writing and is meant to be read a minimum of four times. This is only a partial teaching of the wisdom of the Butterfly. Until human beings accept they are spirits that live forever, they will never know what victory or freedom is. The butterfly is the symbol of freedom and are the wings of victory. The butterfly chooses to be born twice in one lifetime and lives two complete lives. In this way butterflies illustrate that you live forever and life is continual. The physical aspects and forms of the butterfly teaches you the meaning of metamorphosis during the four stages of it�s life. Metamorphosis is the more than physical change that happens between the stages of caterpillar and butterfly. During it�s first life, an egg hatches and the larva is born, growing into a pubescent caterpillar. As an earthbound creature, the caterpillar crawls along the ground. After the completion of it�s life as a caterpillar, a great change will occur. The caterpillar larva will begin to weave and an entire new life will begin. The caterpillar encases itself in a chrysalis that becomes a chamber for it�s metamorphosis into a butterfly. The caterpillar knowingly chooses to die. It knows that change is a simple part of life, necessary in order that one may grow greater. So willingly the caterpillar pupae builds the chrysalis, it�s own coffin and it�s first life comes to an end. Much like a teenage boy becoming a man or a teenage girl becoming a woman, not only do butterflies have to change physically, leaving childhood behind, they have to go through a spiritual change through the acceptance of a conviction to fulfill their destiny. They know they need to change but have no idea what they will change into. During this time the teenager, lays around and dreams change too. In the chrysalis the pupae, much like the pupil/pupal(male or female) in transition, must choose to be transformed. When metamorphosis is complete, a beautiful being emerges reborn and fully winged, signifying it�s elevation as a spirit, beginning it�s new life as a butterfly, it flies! Elevated through flight, the butterfly knows, it is free of the bonds of Earth. Being bound to Earth, you exist throughout time and in time (rhythm). You cause the future and are the future of all living things. The acceptance of this responsibility, would make you beautiful in being and Godlike in Oneness. You are given the will to carry out your conviction and attain your purpose. You like the Butterfly must choose. Allow your ego self to die, in order for you to become the spirit you are meant to be. Once you start to live your convictions, fulfilling your purpose, surrendering every part of your former life, you are no longer bound to the material world. Recognizing the Illusion of the physical world and willingly choosing to understand the Spirit World, is the first step for this transformation. Soon you grow to emerge as a greater being, choosing to enter the Spirit World of the Creator. You become the Spirit the Creator always meant for you to be. You, like the Butterfly, are free! Each time butterflies flap their colorful wings as they begin to soar into the air, they leave a sign of their passing. Tiny flecks of "scale wings" drop off, reflecting different colors, leaving a trail of iridescent light behind. This shedding of prismatic scales helps the butterfly when caught in a predator�s web. The Creator provides perfect protection for all of His Children, when they choose to act in a good and right manner. As the Butterfly shakes their scales of justice, they slip out of their enemies grasp and fly off on their wings of victory! Choose to follow the Butterfly, walk in beauty, always leaving a trail of Light behind you and you too will know victory. To know freedom you must know that you live forever. You have lived since the Creator first thought you into existence. Your spirit was then born through the Earth, your first and true Mother, who provided you with a body for your Spirit, to flow through. You are not some body, you are some one. One spirit flowing through a body. A spirit that belongs to the whole body, of Oneness. Being a Spirit, you know you take after your Father, the Creator God, who lives forever. He made you in His image, so like Him, you live forever. You do not die. It is said that when a butterfly flaps its wings, it sends a wave that is felt around the world and throughout the Universe. This indicates that you are time and through the use of time as your guide, you should understand that whatever you do in this lifetime will reverberate throughout time, multiplying through time. The Butterfly�s wings are shaped in the form of an hourglass, indicating Time. In flight, their wings rotate in a figure eight pattern, or symbol of infinity. Combined they indicate infinite time, an eternity. The butterfly teaches you that you are the future, for you cause the future. Not only for yourself but for all living things. When you think, you physically manifest your thoughts and they make your world. What is in your heart, in your mind, and in your soul, becomes your world. Your world becomes the world we all share in. All your thoughts, become words that are attached to your heart. These �heart thoughts� create all your actions and reactions. Then the heart thoughts grow, becoming your world and the world we all share in. Holding sacred thoughts, given power through your word, will manifest Heaven on Earth. The butterfly also shows you that you have nothing to be sorry for, should you carry out the purpose and convictions the Creator gave you in all of your lifetimes, for there is �Beauty in Passing�. You are reminded of this when the Butterfly flutters by/bye. The passing of one being from this world to the next, should be viewed as a thing of beauty and celebration. For in one being, becoming greater, we all grow greater. You never die. Death is a transformation process. When loved ones pass, should you cry longer than the allotted mourning days, you are telling the Creator that you do not believe that you live forever and that you are not His Child. The bereavement time is called Mourning, to remind you of the new life dawning, in the Morning of the next World. When you look at the beauty of the setting sun, you are seeing the morning sun of the next world and the morning sun of our relations on the other side of the world. For in this way, we can see the circle of life. The beauty you see at sunrise, is to remind you during Mourning, that Morning, is the time you wake up and the dawning of a new life. When you cry too long, you are crying for yourself, for your lack of faith and understanding caused by your separation from the Creator God. Butterflies are wandering spirits. Migration shows you that one Butterfly has the same conviction and destiny as millions of other Butterflies. They are one of a kind. This is their kind and they are one of them. Not all butterflies complete the life journey successfully. Being a Great Spirit, they know the importance of the will of their species to fulfill their destiny for the Creator God. They have oneness in purpose and their individual lives are not lived just for themselves, but for the greater good of all. The Great Spirit of the Butterfly teaches Humans that whatever you teach your children in this lifetime, awaits you in your next lifetime. If you concentrate on the individual I, you will become blind to the whole. Like the butterfly, wherever you stop, you too should make everything more beautiful because of your passing. Life is continual and you never die. Like the Butterfly, you will receive a new body in the next life, for your spirit to flow through. You will be transformed and made new! To many Peoples throughout the World the Butterfly has long represented, eternal love. God�s eternal love for us. 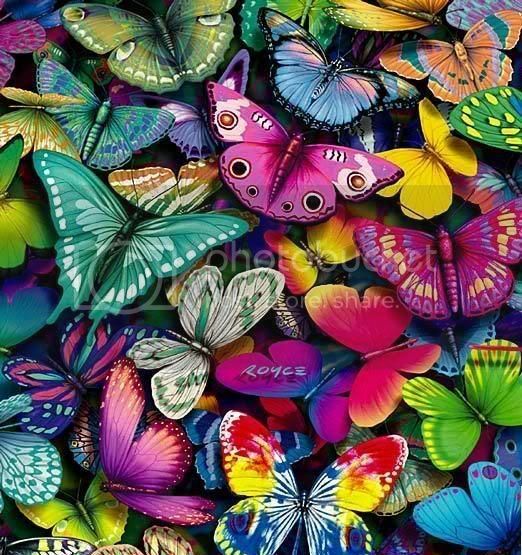 The next time you watch a Butterfly flutter by/bye, remember how much the Creator loves all His Children, and like the butterfly you will fly in freedom and victory.